A quite unexpected yet welcome discovery was made recently at the Huntington. While preparing the Huntington’s enormous print collection for its move into new quarters, a miscellaneous group of drawings emerged from among the prints. One of these (illus. 1) was identified by an attached scrap of paper as follows: “450 Blake . . . The Plague”. Although unsigned, this pencil drawing, measuring approximately 24.2 × 29.8 cm., was clearly related to the well-known series of designs by Blake called “The Plague” or “Pestilence.”1↤ 1 Martin Butlin summarizes the history of this subject in Blake’s oeuvre in The Paintings and Drawings of William Blake (New Haven and London: Yale University Press, 1981), p. 70. 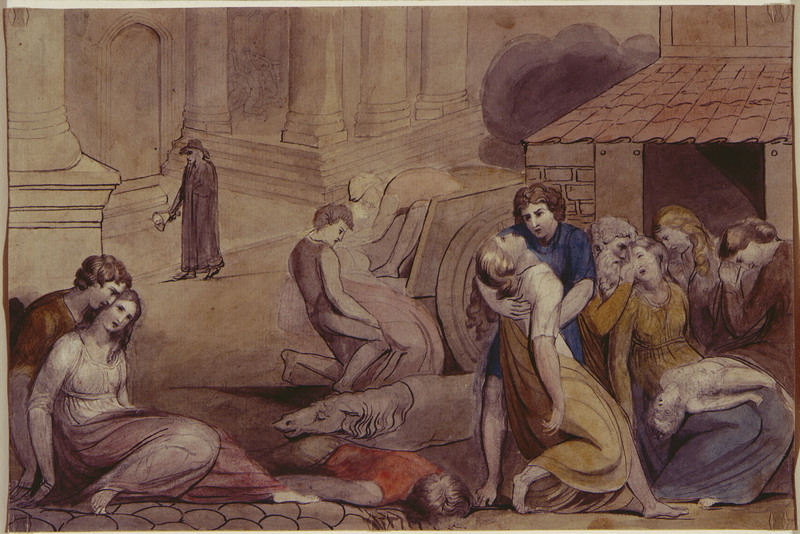 In keeping with most other Blake scholars, Butlin feels that the subject of “Pestilence” developed out of Blake’s early watercolors of English history of c. 1779. The earlier versions may refer, in fact, to the historical Plague of 1665. Some scholars suggest that the later variations on this theme may refer to the Bible, Exodus, ix, 10, or to the Litany. Butlin views these interpretations as unlikely due to the origin of the composition as one of the English history subjects. Some of the watercolors bear inscriptions which have led to titles such as “The Plague” (the Steigal watercolor, Butlin no. 184, and the Huntington pencil drawing) or “Pestilence” (the Bateson, Butlin no. 190, and the Bristol, Butlin no. 192, watercolors) or as both “The Plague” and “Pestilence” (the Essick, Butlin no. 185, and the Boston, Butlin no. 193, watercolors). To simplify matters, I shall refer to this subject throughout the article as the Plague/Pestilence. Comparison of this drawing with other works by Blake quickly established its authenticity.2↤ 2 Martin Butlin, Robert Essick, and Robert Wark were consulted regarding the authenticity of this drawing. All three independently concluded that it was, indeed, executed by Blake. The drawing bears all of the earmarks of Blake’s distinctive calligraphic style. In particular, it displays the rather crude, often hesitant line which is associated with his preparatory pencil studies, such as those listed as “Drawings for the Earlier Illuminated Books and Other Similar Sketches” (nos. 215-243A), c. 1789-1795, in Martin Butlin’s authoritative work, The Paintings and Drawings of William Blake. From these gauche beginnings Blake would develop the flowing, expressive contour lines characteristic of his finished designs. Although an awkward example of Blake’s talents as a draftsman, the newly discovered drawing provides some valuable information about the other five versions of this subject, which occupied Blake from about 1779 to 1805. 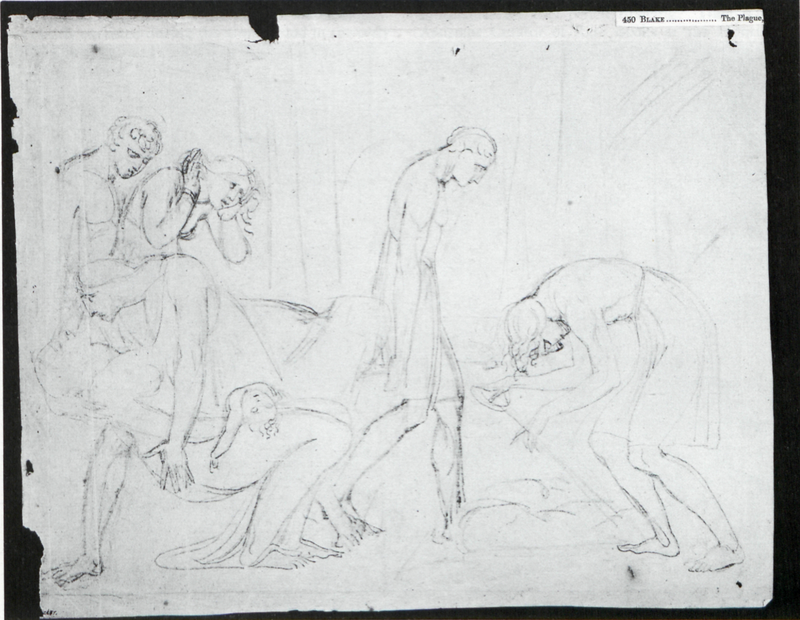 Because this is the only known preliminary pencil study for the subject of the Plague/Pestilence, it assists in establishing the chronological order of the existing five watercolors. And, in fact, it reconfirms the following arrangement suggested by Butlin:3↤ 3 Butlin, pp. 70-71, 73-75. (no. 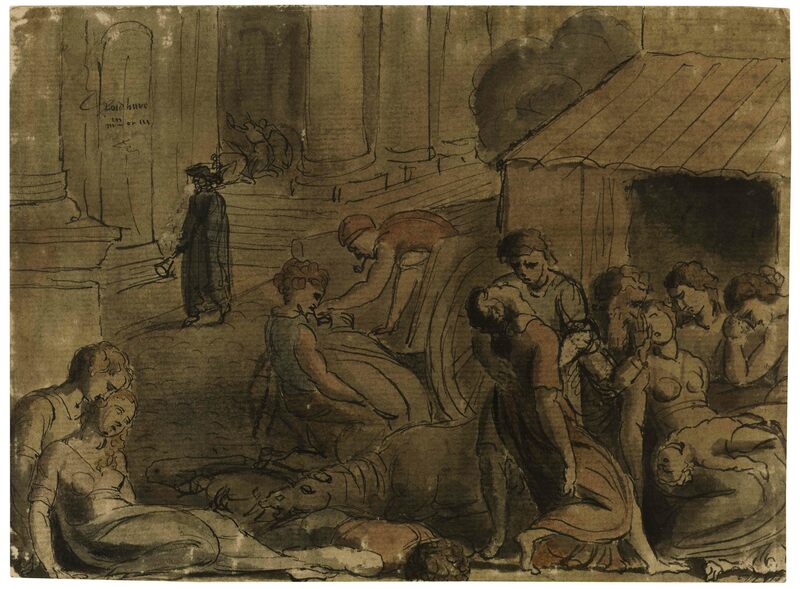 184) “Pestilence, Probably the Great Plague of London,” c. 1779-80, pen and watercolor (with a certain amount of scratching out), Steigal Fine Art, Edinburgh (illus. 2); (no. 185) “Pestilence,” c. 1780-84, pen and watercolor, Robert N. Essick, Los Angeles (illus. 3); (no. 190) “Pestilence” (recto), c. 1790-95, pen and watercolor, the late Gregory Bateson, Ben Lomond, California (illus. 4); (no. 192) “Pestilence,” c. 1795-1800, pen and watercolor, City Art Gallery, Bristol (illus. 5); (no. 193) “Pestilence,” pen and watercolor over pencil, Museum of Fine Arts, Boston (illus. 6). The two earliest versions of this Plague/Pestilence theme, probably dating from 1779-84,4↤ 4 Butlin, pp. 70-71. share several features which differentiate them from the three later versions, also linked by common characteristics. Variations in gesture and in arrangement of the figures and general composition indicate that the pencil drawing is most closely associated with the three later watercolors which Butlin dates between about 1790 and 1805.5↤ 5 Butlin, pp. 73-75. For example, the Steigal and Essick watercolors both contain a bellman and town square in the background. These and other features have been eliminated in the Huntington pencil drawing and the three later watercolors. Likewise, the general placement of the figure groups are almost identical in the two early watercolors and have been radically modified in the pencil drawing and the three later watercolor versions. The number of figures have been considerably reduced and those remaining have been enlarged and more rigidly confined to the foreground plane. Due to these stylistic adjustments the Huntington drawing and the later watercolors are less congested, with a more emphatic lateral orientation. Concern with spatial effects has been sacrificed for a classicizing, frieze-like composition. The resulting arrangement is more monumental and restrained, providing an effective foil to the exaggerated gestures of despair and anguish. Once Blake had settled upon this alternate composition, he focused almost exclusively in his later studies on variations in the emotive gestures, making only minor adjustments in the overall composition. For example, an interesting insight into Blake’s evolution of a design is revealed by his treatment of the only figure group which appears in all six versions of the Plague/Pestilence, the man clasping the dying woman. In the Steigal and Essick watercolors this group appears in the right foreground and in the Huntington drawing and Bateson, Bristol and Boston watercolors it appears in the left foreground. In the two earlier versions, the male figure is turned three-quarters toward the viewer. Little emotion is generated by what seems in these watercolors to be simply the mechanical, physical act of catching a falling figure. In the later four begin page 133 | ↑ back to top versions the man now hunches over the female figure with gestures, particularly the tensed, splayed fingers of his left hand, which indicate both physical and emotional stress. In the Huntington drawing and the Bateson watercolor his head is turned to a profile view, probably as part of the general reorganization of the composition into a more two-dimensional, frieze-like orientation. In the Bristol and the Boston watercolors, his head has been returned to a three-quarter view to give full play to the representation of his anguished facial features. As in the case of several other modifications and variations, Blake’s experiments came to fruition in the splendid Boston watercolor. Although more rudimentary in nature, the Huntington pencil drawing adds to our understanding of Blake’s complex creative process. 1. William Blake. “The Plague.” Unsigned pencil drawing (24.2 × 29.8 cm.). Courtesy of Henry E. Huntington Library and Art Gallery, San Marino, California. By comparing similar alterations in gesture and secondary details, it can be demonstrated that the newly discovered pencil drawing is closely related to the Bateson watercolor of about 1790-95. 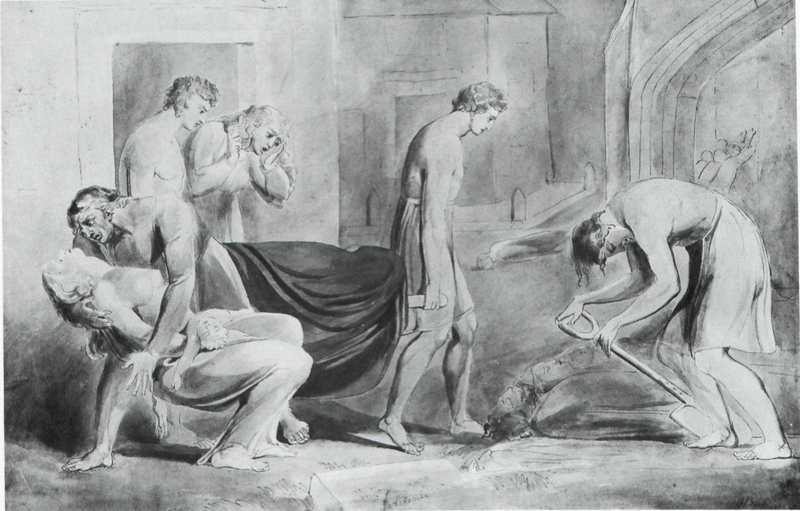 For example, one of the most clear cut examples of Blake’s progressive development of an expressive device is in his treatment of the dead baby lying across the lap of the mother. In the Huntington drawing and the Bateson watercolor the baby is placed in a rather relaxed position as if it has just fallen asleep. In the Bristol and the Boston watercolors the baby’s left arm has been extended across the mother’s legs in a crucifix-like position more clearly and expressively indicating the child’s sad condition. Similarly, in the Huntington drawing and the Bateson watercolor the mother’s eyes are closed as if she had merely fainted away, while the fixed state of her open eyes in begin page 134 | ↑ back to top the Bristol and the Boston works effectively suggests the final stages of death or death itself. 2. William Blake. “Pestilence, probably the Great Plague of London,” c. 1779-80. Pen and watercolor (13.8 × 18.6 cm.). Courtesy of Steigal Fine Art, Edinburgh. this artistic progression of the three late versions. Since the Boston watercolor is the most complex and developed of the compositions, the Huntington drawing could not have followed it. The pencil drawing may represent an earlier idea that was modified in the three later variations. 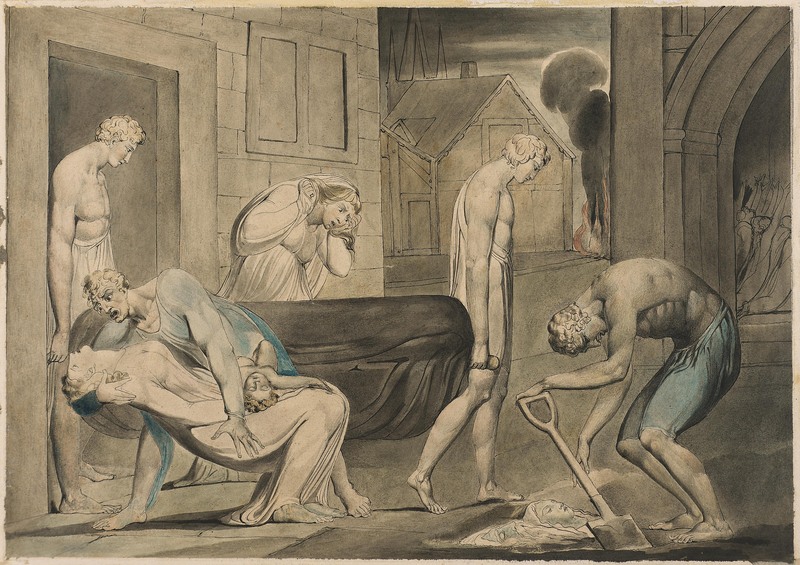 The fact that this work is executed in pencil, a medium which Blake, as his contemporaries, used for preliminary studies, also reinforces this arrangement in sequence. It seems likely that Blake would begin his complete reworking of the earlier composition with a pencil study before proceeding to watercolor. The variation in other expressive details, however, suggests a slightly different chronological ordering with the Huntington drawing directly following the Bateson watercolor. For example, in the Bateson watercolor all of the heads are positioned in strict profile. In the pencil drawing the heads are placed in a profile view except for the heads of the woman and man in the left background begin page 135 | ↑ back to top which are turned to a three-quarter view. This placement of the woman’s head is continued in the Bristol and the Boston watercolor, although the litter carrier’s head is returned to profile view. If one sees a clear-cut and consistent development in Blake’s art during this period from two-dimensional profile views to more three-dimensional renderings,6↤ 6 This chronological ordering has been suggested to me by Robert Essick. the three-quarter turn of the female’s head in the Huntington drawing and Bristol and Boston watercolors links these works and suggests that they, in turn, follow the Bateson watercolor. Blake does not, however, continue the three-quarter view of the litter carrier which he introduced in the Huntington drawing. In both the Bristol and the Boston watercolors he returns to the profile view. Perhaps he felt that the morose, dejected detachment of this figure was more expressively rendered by the profile view when amplified by the identical pose of the other litter bearer. 3. William Blake. “Pestilence,” c. 1780-84. Pen and watercolor (18.5 × 27.5 cm.). Courtesy of Robert N. Essick, Altadena, California. stylistic features which characterize Blake’s work of this time, such as “Los and Orc,” c. 1792-93 (Butlin no. 255), or “Three Falling Figures,” c. 1793 (Butlin no. 256) or other designs associated with the illuminated books of the early 1790s. Like the pencil drawing, all of these works display a strong two-dimensional, frieze-like organization of the composition with little concern for spatial effects. Blake does not exploit three-dimensional effects of modeling in these works of the early 1790s, but instead concentrates on flat, linear patterns, typical of much of the work of several of his contemporaries at this time such as John Flaxman and Thomas Stothard. In his later works, such as the Boston version of the Plague/Pestilence dating to about 1805, Blake reintroduces the more rigorous, robust effects of modeling. In the last few months some new information has come to light which makes it possible to suggest a provenance for this pencil drawing.7↤ 7 I would like to thank Thomas Lange and Robert Essick for so graciously turning over to me this new information concerning the provenance of the Huntington drawing. Their generous assistance throughout this project has been much appreciated. Thomas Lange, Assistant Curator of Rare Books at the Huntington, discovered the following notation in the catalogue of begin page 136 | ↑ back to top William Bixby’s sale of books at The Anderson Galleries in New York in 1916.8↤ 8 The title page reads as follows: BEAUTIFUL BINDINGS/ RARE AND FINE BOOKS/ AUTOGRAPH LETTERS/ VALUABLE MANUSCRIPTS/ BEING DUPLICATES AND SELECTIONS/ FROM THE FAMOUS LIBRARIES OF/ MR. HENRY E. HUNTINGTON/ OF NEW YORK/ AND/ MR. WILLIAM K. BIXBY/ OF ST. LOUIS/ WITH AN IMPORTANT CONSIGNMENT OF RARE BOOKS/ ON EARLY LITERATURE FROM THE ESTATE OF/ MR. E. DWIGHT CHURCH/ FORMERLY OF BROOKLYN/ TO BE SOLD/ MARCH 29, 30, AND 31, 1916/ . . . / THE ANDERSON GALLERIES/ MADISON AVENUE AT FORTIETH STREET/ NEW YORK. A short time later, Lange also ran across the following entry in the catalogue of Frederick Locker-Lampson’s Rowfant Library which was published in London in 1886.9↤ 9 The title page reads as follows: THE ROWFANT LIBRARY:/ A CATALOGUE/ OF THE/ PRINTED BOOKS, MANUSCRIPTS,/ AUTOGRAPH LETTERS,/ DRAWINGS AND PICTURES,/ COLLECTED BY/ FREDERICK LOCKER-LAMPSON/ BERNARD QUARITCH,/ LONDON, 1886. —Blake’s Illustrations of Dante. Seven Plates designed and engraved by W. Blake, Author of “Illustrations of the Book of Job,” &c., &c. [1824-27] India Paper. Large Folio. The illustrations are to the following passages of Dante . . . An Original drawing of the Plague, by Blake, one of the compositions given by Mr. F. Palgrave in his article on Blake in the “Quarterly Review,” is inserted. 4. William Blake. “Pestilence” (recto), c. 1790-95. Pen and watercolor (31.6 × 48.1 cm.). Courtesy of The Ackland Art Museum, The University of North Carolina at Chapel Hill; loan of Lois Bateson. noted in Gilchrist’s 1863 and 1880 editions of The Life of William Blake. In the 1880 edition, Rossetti lists in volume 2, under “Uncoloured Works,” no. 20, “1805.—Plague. An expressive and reasonably careful sketch for the grand water-colour No. 60, List I, engraved Chap. VII, Vol. I.” The 1863 edition contains a similar description in volume 2, under “Uncoloured Works,” no. 18, “1805.—Plague. [Mr. Harvey.] An expressive and reasonably careful sketch for the grand water-colour No. 55, List I, engraved facing p. 54. Vol. I.” Both entries undoubtedly refer to a pencil drawing rather than as heretofore assumed to the watercolor version in Bristol.10↤ 10 Butlin, pp. 74-75. The notation that this pencil drawing was in Francis Harvey’s collection in 1863 also led to a re-reading of the Blake entry in Harvey’s sales catalogue of 1865. Here the Plague/Pestilence subject is described as part of a lot of sixteen “sketches in ink and pencil.”11↤ 11 Noted in Butlin, no. 180, p. 68. This entry also probably refers to a pencil version although it too has previously been associated with the watercolour in Bristol.12↤ 12 Butlin, pp. 74-75. Thus, it would seem that a Blake pencil drawing begin page 137 | ↑ back to top of the Plague/Pestilence passed into Harvey’s collection before 1863. The absence of Harvey’s name in Rossetti’s list in the 1880 edition of Gilchrist indicates that prior to 1880 it already had passed out of Harvey’s collection and probably into Locker-Lampson’s Rowfant Library. At some point before 1886, Locker-Lampson must have had the drawing laid into an edition of Blake’s Illustrations of Dante. It probably remained in his collection until 1905 when the Rowfant Library was purchased by E. D. Church of Brooklyn,13↤ 13 Seymour De Ricci, English Collectors of Books & Manuscripts (Cambridge: Cambridge University Press, 1930), pp. 174-176. who in turn sold most of the Rowfant Library to American collectors through the firm of Dodd, Mead & Co. 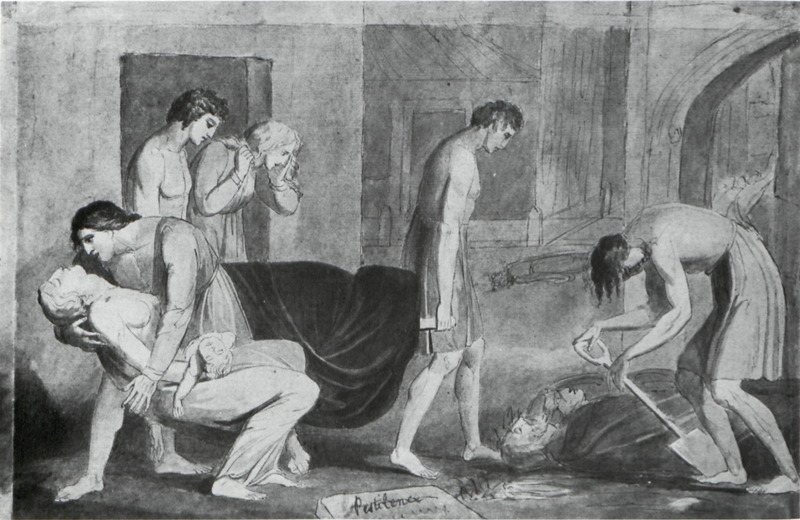 This is most likely how the drawing, laid into a copy of Blake’s Illustrations of Dante, entered the collection of the St. Louis book collector, William Bixby. 5. William Blake. “Pestilence,” c. 1795-1800. Pen and watercolor (32.2 × 48.4 cm.). Courtesy of City of Bristol Museum and Art Gallery. explanations can be proposed, although none are entirely convincing. Since books from Henry Huntington’s collection also were sold at the Bixby sale in 1916,14↤ 14 See footnote #7. perhaps Huntington or one of his agents purchased the copy of Blake’s Illustrations of Dante including the pencil drawing. The drawing may then have been excerpted and the edition of Dante prints rebound.15↤ 15 Geoffrey Keynes mentions that the first twenty-five sets of the original issue of Dante engravings were handled by a printseller, James H. Chance, Linnell’s nephew, who had them bound in green hard-grain cloth; see Blake’s Illustrations of Dante, a fascimile published by The Trianon Press, London, 1978, Introduction. The copy in Locker-Lampson’s collection is described as bound in “original green cloth boards.” The copy in the Bixby sales catalogue is described simply as “cloth” but also may refer to the original green cloth binding. It is quite easy to imagine that a later owner may have been dissatisfied with this cloth binding (or it may have fallen into disrepair) and decided to have the copy of engravings rebound and the pencil drawing excerpted. None, however, of the three copies of Blake’s Illustrations of Dante now in the Huntington collection fit this description.16↤ 16 The original nineteenth century copies in the Huntington Library are as follows: Dante Alighieri. [e] Blake’s Illustrations of Dante, . Bound in half olive morocco. A notation on the Huntington Library catalogue card indicates that this may be the Dorman copy, sold in 1886 (57437). Idem, [1892?]. Bound in olive morocco, indicating that it was probably bound prior to entering the Huntington (57438). Idem. Loose in portfolio, with the original cover label. Gift to the Huntington by Mrs. Donald MacIsaac in 1951 (283403). Perhaps the rebound copy was sold as a duplicate as was Huntington’s wont when other editions entered the collection, leaving the excerpted drawing at the Huntington. This does not, however, adequately explain how the drawing was lost among the print collection for such a long time. It bore the label identifying it as a Blake and it seems unlikely that anyone associated with Huntington or his collection would have overlooked its significance. Another alternative explanation is that the copy of Blake’s Illustrations of Dante containing the drawing was begin page 138 | ↑ back to top purchased by an as yet unidentified American collector who had the drawing removed and added to his or her collection. The drawing may subsequently have entered the Huntington as part of a cache of prints and miscellaneous material. The drawing, indeed, was discovered housed in the Huntington print collection along with a small batch of miscellaneous British and Continental drawings. The pencil drawing of the Plague/Pestilence was found in close proximity to the Seeberger collection of prints in the Huntington.17↤ 17 Seeberger is listed in Lugt as follows: “Charles[e] D. Seeberger sembe avoir collectionné des estampes anciennes et modernes, surtout des pointes-sèches. A Chicago où il doit avoir vécu, on n’a trouvé aucune trace de sa personne, ni de sa collection. Même résultat à New-York où il est inconnu au Yale Club, qu’il donnait pourtant d’habitude comme adresse. Première moitié du xx3 siècle;” Frits Lugt, Les Marques de Collections de Dessins & D’Estampes, supplement (La Haye: Martinus Nijhoff, 1956), p. 343. No record survives of when or how the prints and the few miscellaneous drawings from the Seeberger collection entered the Huntington. Perhaps the efforts of a former Huntington employee, Roy Vernon Sowers, supposedly the son-in-law of Seeberger, resulted in this generous gift to the Huntington, probably at some point in the 1930s. The drawing does not, however, bear the collector’s mark which Charles Seeberger so assiduously applied to all of the objects in his collection. 6. William Blake. “Pestilence,” c. 1805. Pen and watercolor over pencil (31.2 × 43 cm.). Courtesy of Museum of Fine Arts, Boston. the Bixby and the Huntington collections. Or, to the contrary, it may prove that the Huntington drawing is only one of several pencil studies that Blake made of the Plague/Pestilence. This part of the puzzle remains unsolved. Coll: ?Mrs. Blake; ?Frederick Tatham, sold Sotheby’s 20 April 1862 (in lot 200 or 201) bt. Harvey; Francis Harvey by 1863, offered in catalogue c. 1865 (lot 16 “sketches in ink and pencil”); Frederick Locker-Lampson by 1880, offered in sale of the Rowfant Library, London, 1886, laid into a copy of Blake’s Illustrations of Dante; ?E.D. Church; William Bixby, sold The Anderson Galleries, N.Y., March 29, 1916 (lot 983), laid into a copy of begin page 139 | ↑ back to top Blake’s Illustrations of Dante; . . . ; Henry E. Huntington Library and Art Gallery.